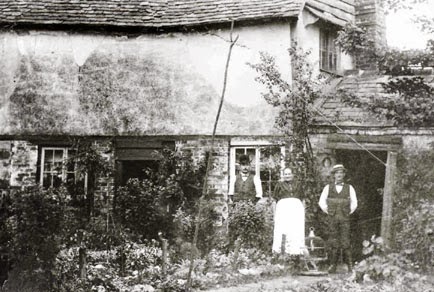 This photo, c. 1900, shows the Jacobs outside their cottage, which faced on to Dorney Common. The Jacobs worked on the nearby farms. Mr Joseph and Mrs Annie Jacobs both born in Wargrave in the 1840's and were married in 1868. The census records show that they were living in Bray in 1871, White Waltham in 1881. The 1891 and 1901 census records show them to be living in the Parish of Dorney and 1911 Boveney & Dorney. They had 6 children 5 boys and a girl. Note the parrot in a cage, a popular addition to many households in those days. As there is no washing on the line can we assume that this photograph was taken on a Sunday?